I liked the concept of applying a hobby you need a lot of patience for in real life issues. I like that this book is about friendship between very different people. 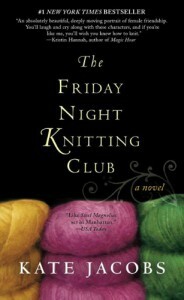 I like that there is something as simple as a knitting hobby that would connect people with very different backgrounds. I thought this would be a romance kind of novel (which was okay) but it was only partly that (which was okay too). Although the book can be engaging, realistic and cute at some point, I didn't like how it ended. It's not because it was sad. It just didn't make sense.I don't want to sound pessimistic but if you analyze the events in the main character's life it's like the bottom line is that some people just have really bad luck and you can't do anything about it so boo-hoo. It was realistic, maybe. But ... meh. Guess this could've just been called some sort of memoir for an unknown person instead of a novel.